It looks like "Free Fridays" coupons are back at Save.ca! They had this promotion last summer as well, every Friday there was a new Free coupon up for grabs, we are excited to see what new coupons are coming up! 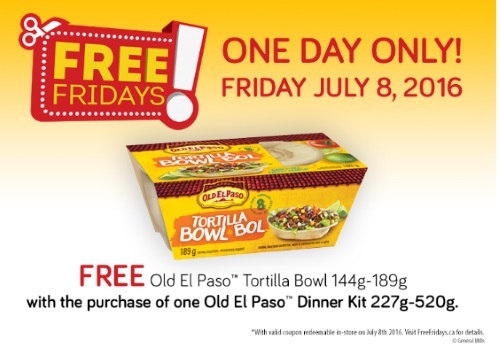 Claim your coupon for a Free Old El Paso Tortilla Bowl (144g-189g) with the purchase of one Old El Paso Dinner Kit (227g-520g). This coupon is only redeemable on one day, Friday, July 8 2016. This coupon is also available in the Walmart coupon portal, if you want a second one!